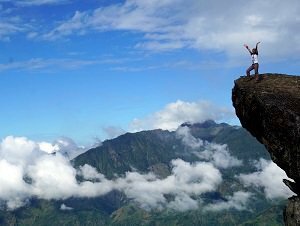 Mount Ulap eco-trail is a 9.21km hiking path located at the Ampucao - Sta. Fe ridge in Itogon, Benguet. What used to be a stomping ground of trail runners, this ridge gained popularity after the municipality opened its tourism doors to hikers. It attracts a good number of weekend warriors due its close proximity to Baguio City. 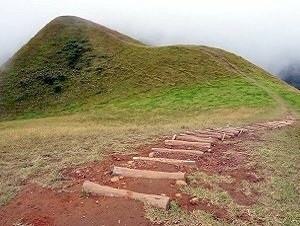 It is a straightforward hike with established trails on a pine forest with rolling hills and grasslands. With a good clearing, you will see Mt. Sto. Tomas in Baguio and the plains of Central Luzon. 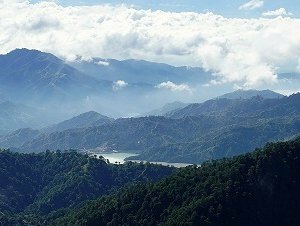 Nature-lovers will have a great time walking on paths littered with purple melastomas, lichen-covered Benguet pine trees and acorns. The rolling mist gives a magical, mystical feeling while trekking in the woods that reveal panoramic verdure landscapes where cows graze. Looking for a place where you can practice your star photography skills? Mt. 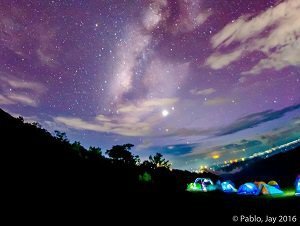 Ulap's campsites provide some of the best places where you can set-up your camera and take photos of the Milky Way. Watching the sunrise or sunset is also a popular activity here. So grab your camera, bring your family and friends and let's start rocking the trail towards the clouds. Team TRIPinas is excited to present one of its newest trekking destinations - Mt. Ulap eco-trail. We can arrange your trip from Manila o Baguio City. We offer both full-logistics support (includes transfer from/to Manila and/or Baguio City, accredited guide(s) and meals at the mountain) or partial logistics support (you tell us what kind of assistance you need, e.g. guide and fees only). Our package can be either a day-hike or an overnight trip --- it's ultimately your call. All of our trips are private which means that you have a say on your schedule (you can go on a weekday or weekend), you'll have a dedicated guide (not shared with other groups) and (if you're getting a land transfer from us) an exclusive transport service as well. We can even advise you when to best go so you can catch the most awesome display of the Milky Way for your night shots. How cool is that? Best of all, your trip is backed by a decade of TRIPinas tours outfitting experience to ensure that you have a safe and fun adventure to this mist-covered mountain in the north. Book now! Meet-up will be at Quezon City around 10PM. After a thorough briefing from the tour coordinator, everyone boards the vehicle and head out for Baguio City. At around 5AM, you will finally reach the City of Pines where you will disembark from your van/bus and an hour will be given for all to have a hearty breakfast. Once everyone is full, please board the assigned jeep to go to the registration site at Brgy. Ampucao where your dedicated guide will be waiting for you. After some introduction and a few reminders on climbing etiquette, you will commence your hike starting at Tomtombek. Brace yourself for a steep walk up to the first view deck. Once at the view deck, give yourself some time to take in the sights before continuing your trek. For the most part, the walk will be on pine tree-lined trail, naturally decorated by purple-colored melastomas, sunflowers and wild raspberries (sapinit). Every now and then, you will cross some wooden gates that were meant to contain cows that roam around freely in the mountain. 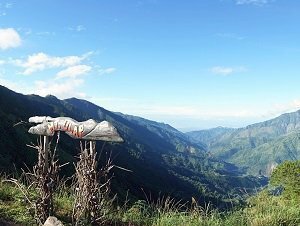 The landscape is so pretty that before you know it, you have already Ambanao Paoay aka Peak 1 (1788 masl). Continuing from here, you will reach Gungal or Peak 2 (1814 masl), arguably the most photographed* spot in Mount Ulap. 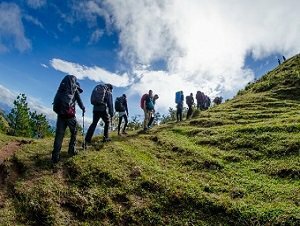 Walking for another kilometer from Gungal, you will reach the peak of Mt. Ulap (1846 masl). Take note of the pitcher plants growing close to the old border stone. Visibility here varies widely - one minute you have a sweeping view of Baguio City, then a few moments after you are enveloped in a thick fog you can hardly see anything. From this point, hiking will be all downhill (literally). Take extra care when going down especially when the visibility is poor. You don't want to bump into a grazing cow. You can have your lunch break at one of the make-shift carinderias before you continue your 2-km descent. After about an hour, you will finish your traverse and exit at Sitio Sta. Fe where your return vehicle awaits. You may use the toilet facility at the exit to freshen up before you board your land transfer and return to Baguio. Once there, feel free to have a celebratory dinner before heading back to Manila. If you wonder what you should wear and bring, if you have no idea on what will happen during the tours then read this. We have listed all what you should know. ❶ Due to its close proximity from Manila and Baguio City plus the plethora of Instagram-worthy photos taken from this mountain, the mountain can get a little crowded on weekends and holidays. If you have the luxury of time, try to arrange your trip to avoid the mountain congestion that happens during long weekends. That being said, the area can offer some pockets of solitude if you know where to look. ❷ Start your hike as early as possible as the heat can get intense past 8AM. Remember that some portions of the trail are exposed. Wear a strong sunscreen. ❸ There are no water sources on the trail so bring ample supply of drinking water. ❹ Visibility conditions at Camps 2 and summit vary widely. Wait until you get a clearing before you ascend or descend to avoid accidents. ❺ Cows are aplenty. They graze at some of the camps. They are normally tame and will let you be but, as with all animals, they can lose their temper. Do not provoke them with endless cow selfies. ❻ Follow your guide and stick with the established trail. The weather is tricky at the higher camps and you may get disoriented when the fog rolls in.